A new Xbox One Preview update rs1_xbox_rel_1610.161021-1900 is now rolling out. There are no new feature in this update, only bug fixes. The new Preview update brings fixes and improvements for Xbox Clubs, Cortana, Store and more. Cortana now act faster on basic commands like “Pause,” and “Watch Netflix.” Hopefully. Check out changelog below. This build includes updates to the console speech recognizer for US and UK users, which reduces time to recognize commands like “Pause”, “Play”, “Mute”, “Yes”, and “No”. In addition, recognition has been improved for phrases such as “Watch NBC” “Watch FOX”, “Go to Netflix”, and “Open YouTube”, and should revert to web or marketplace searches less often. The See-It-Say-It timeout has been extended. This means users will have more time to make selections when saying “Hey Cortana, make a selection” or “Hey Cortana, select”. Resolved an issue which could sometimes prevent the Store from launching. Certain elements of the Store have been streamlined for an improved user experience. Users with consoles set to the Singapore region (zh-sg or en-sg) should now see all appropriate apps while browsing the Store. Fixed an issue which sometimes caused Clubs you’re participating in to fail to display under “Your clubs”. When attempting to set an image as a Club background, recently created Clubs should no longer fail to display under “Choose a Club”. You should no longer encounter a “Something went wrong” or “That didn’t work” error when attempting to access invitation requests or recommendations. Resolved numerous issues with unlocalized text (strange text characters) appearing in Guide. Resolved an issue which sometimes caused the “Connect to LIVE” section to not appear on Home when no network connection is detected. 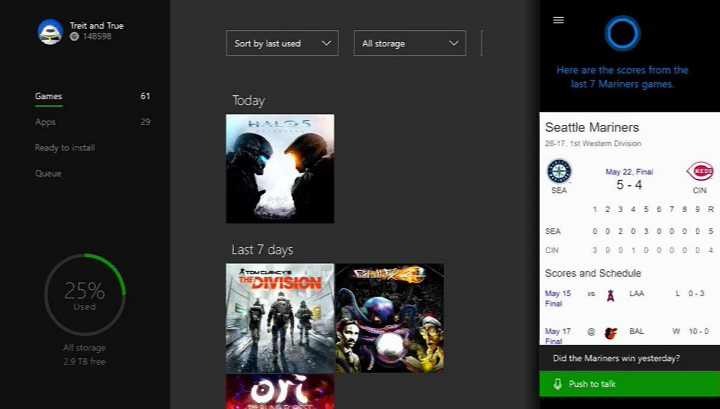 Uninstalled games and apps should no longer display in the most recently used section on Home.